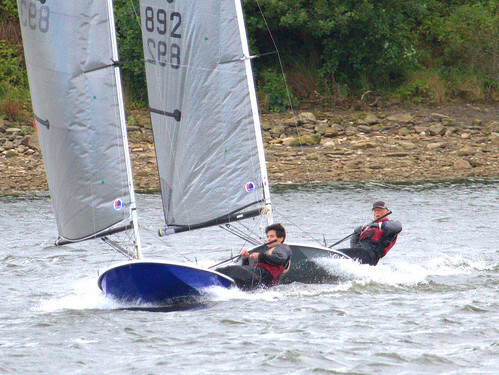 Staunton Harold Sailing Club provided a grab bag of testing conditions at the British Nationals. There were high winds and exhilarating planing. There were proper Moth conditions – little wind and lots of time to take in the sights. There was more swimming than sailing. There was a nice warm bar with comfy sofas for afternoon naps. 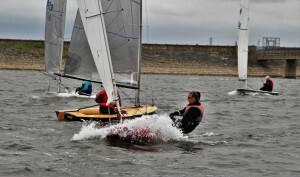 Twenty-seven competitors from fifteen different clubs turned up for the four day event, despite the un-Moth-like weather predictions. They were not disappointed. Bruised, yes. Aching, definitely. Disappointed, no. Practice race, Day 1, and only eight boats launched into the strong on-shore westerly. A short but lively race ensued, with one retirement due to superstition and two from exhaustion. 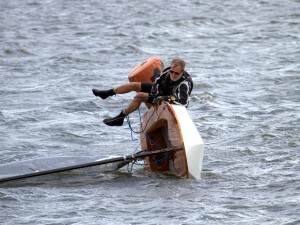 Of the remaining five, two sailors capsized but managed to get back in without assistance to finish. It was a taste of things to come. 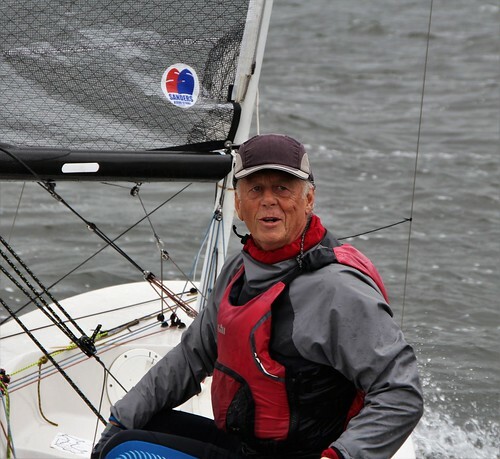 Sixteen boats made the line for the first official race of the Nationals – the Teddy Hicks trophy – emboldened by the lessening in the frequency of the gusts. The start was close but after that, the wind, the length of the course, retirements (5) and capsizes spread the competitors out, with only the two frontrunners – Tim Davison (892) and Robbie Claridge (893) keeping close to each other. The lead changed a number of times, but Davison prevailed, ahead of Claridge and Andy Mathews (881). Come Day 2, and with the forecast of wind speeds up to 27 knots, gusting 41, most of the sailors decided to throw caution (and their bodies) to the wind. Twenty Moths crossed the start line, aided by a strong but steady wind down the reservoir. Upwind, the fleet split as searched for VMG, with Davison and Claridge having the best of it, rounding the first mark ahead of the rest. From then on, there were two battles: between Davison and Claridge for honours; and simply staying upright (for everyone). 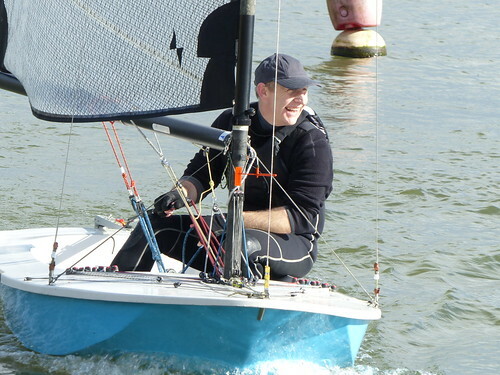 Claridge just managed to pip Davison at the line for first, with first-time Nationals sailor Edward Higson (885) taking third. Four did not make it: the conditions were taking their toll. 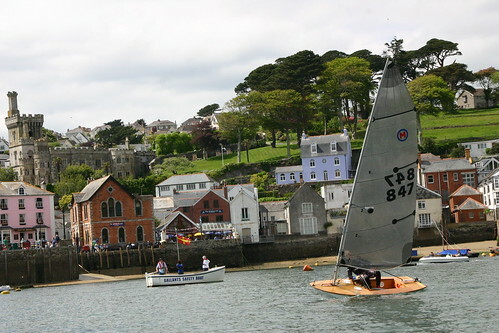 After some discussion between the Moth sailors and the Race Officer, and with the conditions similar to the first race of the day, it was decided to go ahead with the second scheduled race. Damage, exhaustion and discretion led to only fourteen sailors starting. Davison, Claridge, Higson, and Robert Paynter (839) powered up the first beat, but as the promised gusts arrived, staying upright and in one piece became the name of the game. Davison capsized and was assisted, Claridge retired due to gear failure, and one by one boats capsized on the off-wind legs, overpowered by the gusts. Higson and Mathews fought the winds and each other, with Higson taking the honours. Paynter kept upright for long enough to take third. 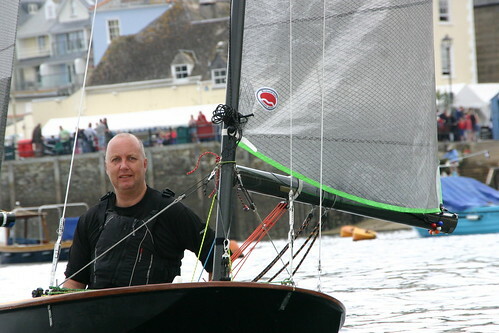 Colin Hall (856), Jeremy Higson (861), and Paul Thomas-Peter (894) were the only other boats to finish. Not that it wasn’t enjoyable for some: Abby Freeley (883) couldn’t wipe the smile off her face; Jenny Bentley (784) practised her long distance swimming; and the spectators had a good time figuring out which boat had gone from Moth to turtle. With wind conditions only short of V2, the third scheduled race was postponed, allowing sailors to regroup, repair, and recover. 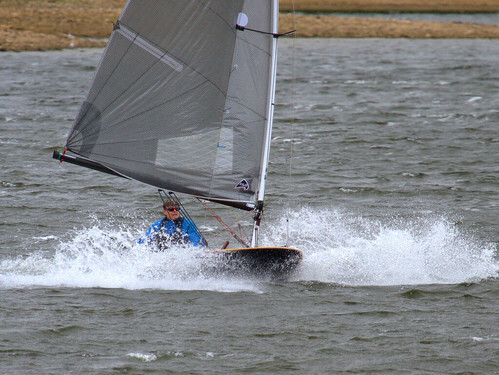 Day 3, and the wind was now a playful 11-12 knots southerly, making it easier to launch off the clubhouse shore. All the Moth sailors headed out onto the water for the fourth race, held over from Day 2. The start was clean, with most boats favouring the pin end, but as they beat up the lake, the fleet scattered, looking for the best approach to the windward mark. The familiar boats of Davison, Claridge, Higson, and Mathews pulled away from the rest. A hard-fought battle ensued, but Claridge held off Davison and Higson to take the race. Races 5 and 6, with winds down to about 8 knots, and the racing between sailors got tighter. Throughout the fleet, there were individual battles, with even the last-placed sailors fighting for position, and the leading sailors failing to lap the tail-enders. Race 5 saw Claridge take his second victory of the day, ahead of Davison and Mathews, while Higson won Race 6, with Davison and Claridge taking the minor placings. The day was rounded off by the annual BMBA dinner: a celebration of both 85 years of the British Moth; and the life of Tom Cooper, who died earlier in the year, and is sorely missed. The last day of the Nationals, and the title of National Champion was up for grabs. The weather had become ‘Moth-like’: barely-there winds and decreasing. This allowed some of the tail-enders to shine, with some ahead of the regular front-of-fleet sailors at the first mark, but experience told, as a long race with three up-wind marks allowed for plenty of place swapping. The wind died completely in the last ten minutes, leaving most boats barely moving (but all upright!). 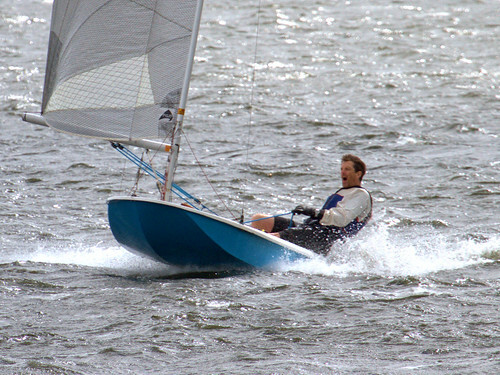 Davison’s light-wind skills gave him the last first place of the Nationals, ahead of Mathews and Claridge. 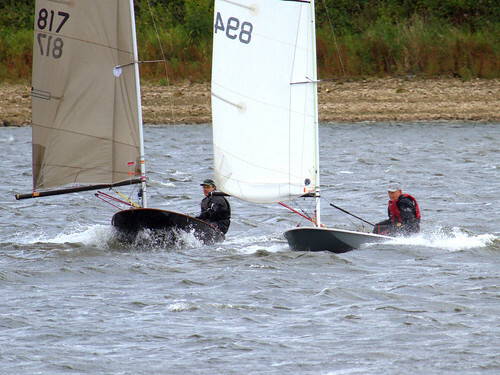 Claridge and Davison finished on equal points overall, so it came down to countback. Claridge, with three firsts to Davison’s two, was declared this year’s National Champion, with Higson third overall. 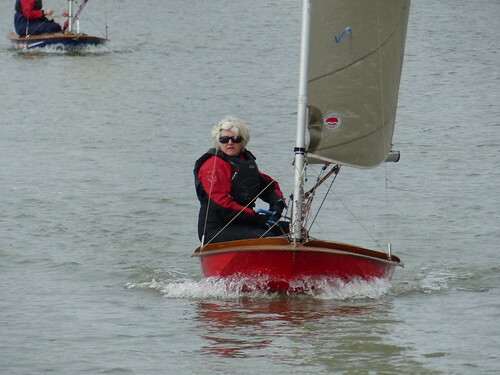 Women’s Champion went to Freeley, Veteran Champion to Davison, and Vintage Boat to Elaine Gillingham (504). 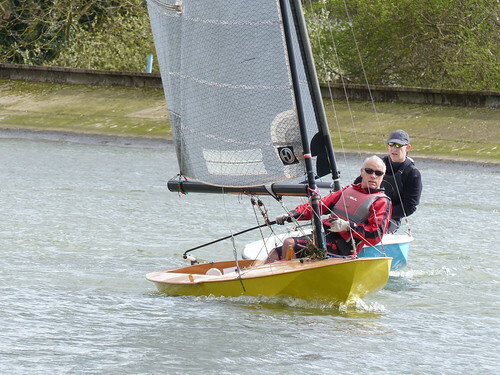 Special thanks has to go to the team at Staunton Harold: the Race Officers; the rescue crews (we have a spare boat if Nigel fancies competing in the Nationals next year); and the galley crew who were often up before we were, making sure that there were enough bacon and egg rolls. Thank you again. 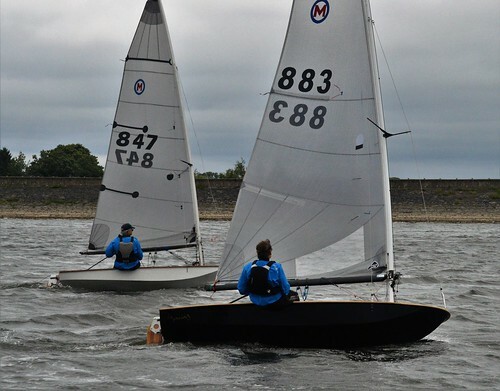 Thanks also to this year’s competitors for an exciting Nationals, and to all those Moth sailors out there who’ve thought about sailing in the Nationals…come on in, the water’s fine!